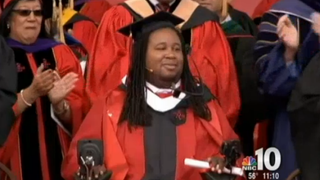 After a bit of a scandal that involved a keynote speaker invite and a rescinding of said invitation, paralyzed football player Eric LeGrand delivered an impassioned commencement speech to his fellow Rutgers graduates Sunday, the Associated Press reports. LeGrand, who suffered an injury during a 2010 game that left him paralyzed, took to Twitter a few weeks back to express his excitement and eventual disappointment about being asked to speak at graduation. Rutgers, which had already lost former Secretary of State Condoleezza Rice due to student and faculty protest, said the LeGrand debacle was merely a miscommunication. On Sunday, LeGrand told the Rutgers 2014 graduating class that anything is possible. "I'm moving my shoulders here. I'm moving myself forward," the 23-year-old told the cheering crowd, AP reports. "Don't ever let someone tell you you can't do something!" LeGrand told the crowd about the tackle he made during a kickoff against Army that left him paralyzed and how he wasn't supposed to be able to have any movement from the neck down. He then noted how he is breathing on his own and can stand up with help, AP reports. "Anything is truly possible in this world," he told the crowd, which bursts into cheers. Rutgers President Robert Barchi then announced that former New Jersey Gov. Tom Kean, the event's keynote speaker (who had supposedly bumped LeGrand from the keynote speaking position, although Rutgers claims that LeGrand was always going to speak just not as keynote) would donate his $35,000 speaking fee to create a scholarship fund in honor of LeGrand. Kean told the graduating class that he longs for the return of civility in politics and civic life. He urged graduates to "help us in this country break this terrible gridlock. Help us hold this society together."